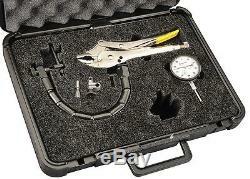 Starrett Continuous Reading Indicator Inspection Kit, 2.250" Dial Size, 0 to 1" Range - S898Z-1. Indicator Inspection Kit, Reading Continuous, Dial Size 2.250", Range 0 to 1", Graduations 0.0010", Dial Reading 0-100, Range per Revolution 0.100", Dial Color White, Bearing Type Jeweled, Back Type Lug On Center, Contact Point Dia. 1, Bezel Lock Yes, Features Allows very precise measurement for automotive repair, Highly flexible configuration, Includes Gripping Plier Inspection Kit, Flex Arm, Case. Contact our expert customer service team at 888.207.3005. Item image(s) may be stock photos and may not necessarily depict the exact item you may receive. The item "Starrett Continuous Reading Indicator Inspection Kit, 2.250 Dial Size, 0 to 1" is in sale since Thursday, April 27, 2017. This item is in the category "Business & Industrial\Manufacturing & Metalworking\Metalworking Tooling\Inspection & Measurement\Indicators". The seller is "sustainablesupply" and is located in Anywhere, USA. This item can be shipped to United States, Canada, United Kingdom, Denmark, Romania, Slovakia, Bulgaria, Czech republic, Finland, Hungary, Latvia, Lithuania, Malta, Estonia, Australia, Greece, Portugal, Cyprus, Slovenia, Japan, China, Sweden, South Korea, Indonesia, Taiwan, South africa, Thailand, Belgium, France, Hong Kong, Ireland, Netherlands, Poland, Spain, Italy, Germany, Austria, Israel, Mexico, New Zealand, Philippines, Singapore, Switzerland, Norway, Saudi arabia, Ukraine, United arab emirates, Qatar, Kuwait, Bahrain, Croatia, Malaysia, Chile, Colombia, Costa rica, Panama, Trinidad and tobago, Guatemala, Honduras, Jamaica, Antigua and barbuda, Aruba, Belize, Dominica, Grenada, Saint kitts and nevis, Saint lucia, Montserrat, Turks and caicos islands, Barbados, Bangladesh, Bermuda, Brunei darussalam, Bolivia, Ecuador, Egypt, French guiana, Guernsey, Gibraltar, Guadeloupe, Iceland, Jersey, Jordan, Cambodia, Cayman islands, Liechtenstein, Sri lanka, Luxembourg, Monaco, Macao, Martinique, Maldives, Nicaragua, Oman, Peru, Pakistan, Paraguay, Reunion.